Still sought after by writers and students, the Tandy WP-2 and Tandy WP-3 are perfect writing companions. Used to take notes, prepare reports and write letters, these WP systems are technically real computers based on a Zilog Z80 processor. 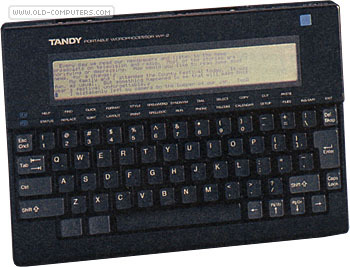 The WP-2 is essentially a Tandy-branded version of a Citizen portable wordprocessor called the CBM-10WP. "There are battery operated, weight only 3.1 pounds and are 1" thin. The full size keyboard lets you cut, paste, search, replace, center and justify your text with just a few keystrokes. And there's no need to lug around a heavy dictionnary. The jet black case houses a 100,000-word spelling checker and a 200,000-word thesaurus. For hard copies of your work, the WP-2 easily connectes to Tandy or IBM-compatible printers. You even add an optional modem to transfer files to your personal computer by phone." The following applications are built-in ROM and available in standard: TEXT, TELCOM, PHONE (address), CALENDAR (schedule), SPELLCHECK and FILES. The WP-2/3 while being dedicated word processors also have a terminal mode and x-modem file transfer capabilities. You can write programs on another computer, assemble them and xfer them to the WP-2/3 with x-modem and they can then be run. The WP-3 seems to be the exact same model except that it has 64 KB as standard (whereas the WP-2 has 32 KB). The only other significant difference between the WP-2 and WP-3 is that the WP-3 has British English dictionary and the keyboard can generate the UK pound symbol. see more Tandy Radio Shack Portable Wordprocessor WP-2 / WP-3 Ebay auctions !